October is already here and autumn is in full swing, and what does that mean? It means colorful leaves, football, caramel apples – and colder temperatures. Among other things, the season is often characterized as a time of frequent temperature changes between indoors and outdoors, and harsh winds. This results in more sensitive skin that can become dry, tight, itchy and irritated. 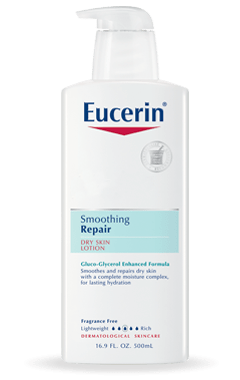 So, before getting that Pumpkin Latte tomorrow, grab some Eucerin Smoothing Repair lotion to keep your skin glowing all season long! Do you have your own helpful tips on how to care for your skin during the fall? Share your secrets with us (and your readers) and tell us what you think of this month’s product spotlight! Also, be sure to keep up with Eucerin online! This month, one lucky Lady and the Blog reader will receive an “Autumn Care Package” on behalf of Eucerin which includes a $100 gift card. I think the brand Eucerin works for itchy skin and keeping them hydrated. I use Eucerin daily replenishing lotion during fall through winter to keep my skin smooth and itch-free. During Fall my skin does great – I usually put on a little extra moisturizer but that’s it. My hands tend to get dryer in cold weather so Eucerin would come in handy!! I use a lot of moisturizer and try to up my water intake. The thing that works best for me is to apply lotion as soon as I get out of the shower and towel off. As long as I do this daily, I don’t have dry skin issues. 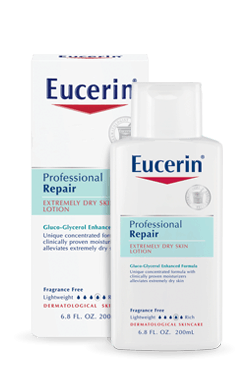 And I love Eucerin products – I’m sure lots of the credit goes to them! Vitamin E really helps my skin! I love Eucerin lotion! I’ve been using it for years! As much as I love hot showers, I try to take only warm showers… Hot showers actually dry out your skin by getting rid of the essential oils in your skin. Drink lots of water and used a great moisturizer, I use Eucerin. I like to use dry oil like Rice Dry Oil by Fresh, during the cold season when I have to bundle up i hate the feeling of lotion w/ clothes on. I use Aquaphor healing ointment and moisturize a lot more as the weather gets colder. I moisturize daily with a light lotion to protect and heal my skin. And I think the Eucerin Smoothing Repair looks great because it is lightweight yet fast absorbing. I just put on a little extra moisturizer during the fall and winter. I use extra moisturizer and also a whole house humidifier. Thanks for the chance to win! i drink extra water! and i think the eucerin products look great for colder weather! I use oil on my skin just out of the shower. Would love to try this! I moisturize right after a shower when my skin is damp and sometimes twice a day. The indoor heat really takes a toll on my skin. Drink lots of water and moisturize, moisture, moisturize!!! Hydrate and moisturize daily and often! I start using thicker creams rather than thinner lotions. I moisturize daily during the fall, and this month’s product spotlight is awesome. More moisture inside and out since the weather starts getting drier and skin can become confused. Right after a shower/bath moisturize with Eucerin, to keep your skin hydrated! Thanks for the great giveaway! My main tip is to always use lotion. Use it when you are done taking a shower and whenever you feel your body or hands get dry. Don’t dry off completely after a shower and apply lotion while damp. -Moisturize often & avoid harsh cleansers. My skin is always drier this time of year, so I have a humidifier, use my moisturizer daily and depend on Eucerin. It is a great brand although I have not tried Professional Repair yet. Yes – I think the most important tip is to moisturize daily. Even better if it has a sunscreen. Eucerin products are the best! I just left a comment and forgot my email. I lotion up after every shower! I use Eucerin intense repair and Body shop shea butter during the winter season to keep my skin moisturize. I use Vaseline or palmers swivel stick on my lips and drink lots of water to keep my skin hydrated. I find if I remember to use hand cream every single night, it helps. Especially around the nails, so that skin doesn’t crack – ouch! Old Skool Vaseline works wonders and olive oil and cocoa butter on my face. My only tip is moisturize, moisturize, moisturize. Lots of water and Shea Butter works for me! Exfoliate regularly, stay hydrated, moisturize multiple times a day! When the heats on, I like to keep a pan of water next to the heater -this helps keep my skin from getting too dry. My hands and feet get really dry especially when I shower with warm/hot water. I try to carry a hand moisturizer in my bag at all times. Before bed I put loads of lotion on my feet and out socks on, when I wake up and remove the socks my feet are so moisturized and soft. I step up the moisturizing…always slather on some lotion (Eucerin) after toweling off from my bath. Besides using moisturizer religiously it really helps hands if you wear gloves when you’re out–the elements can really do a number on them otherwise! Moisturizing immediately after my shower. Always moisturize right after the shower!! Don’t judge! – we shower and bath less frequently! I live in Cali so there is no “winter” conditions, but I still need to wear sunscreen into the Fall here because the sun keeps on shining. love putting lotion on right after shower. feels ah-mazing! Stay hydrated and moisturize daily. Eucerin helps keep my skin moisturize and feeling good and smooth without a greasy sensation. Don’t shower with hot water because hot water will dry out your skin, use warm. Also, right after shower or bath while skin is still damp apply moisturizer. I love the Eucerin product line! I want to enter the Eucerin Contest, I use about 3 different products from them, they are the best even for children they work wonderful. I am a nurse and love the pureness of Eucerin products!